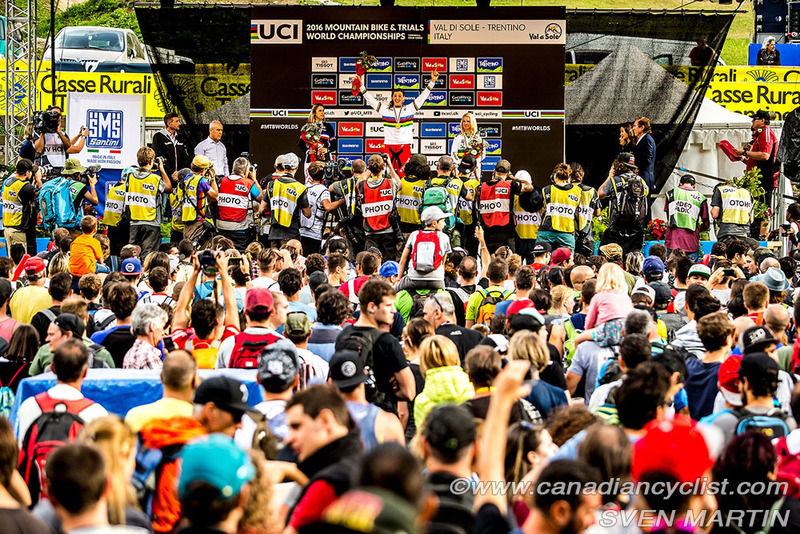 The 2016 UCI Mountain Bike World Championships concluded on Sunday in Val di Sole, Italy, with the Downhill, where rainbow jerseys were awarded in the Junior and Elite categories. 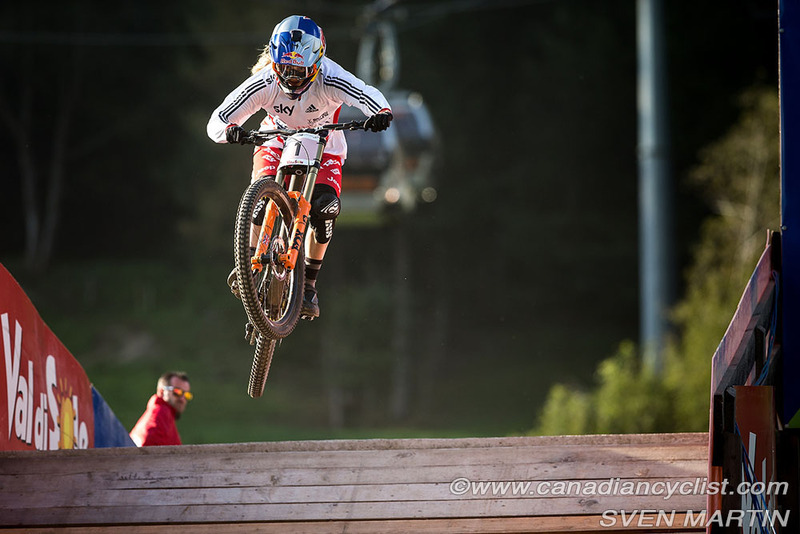 Rachel Atherton (Great Britain) capped a perfect season by successfully defending the Elite Women's title, while Danny Hart (Great Britain) won the Men's title. In the Junior categories, Finnley Iles (Canada) won the Men's, with host Italy's Alessia Missiaggia winning the Junior Women. 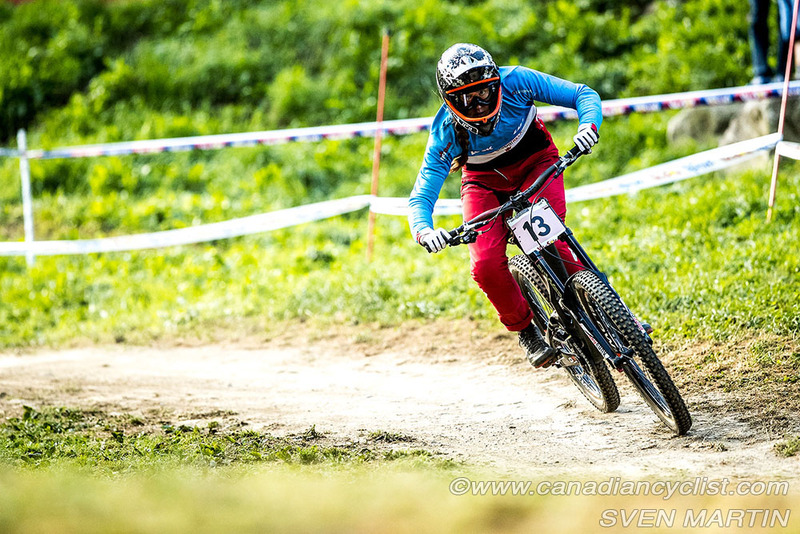 Atherton is on an unprecedented winning streak, with 13 consecutive World Cup wins, including sweeping the 2016 series, and now her second straight world title, the fourth of her career. Atherton was the fastest at all points on the rough and dusty track, leading at both intermediate splits, and finishing with a time of four minutes and 20.187 seconds. Mio Suemasa (Japan), the second rider off, set the early fast time, which stood up until Myriam Nicole of France, who has had a strong comeback after early season injury, bumped her out of the Hot Seat. Manon Carpenter (Great Britain), starting second from last, crashed in the first turn, taking her out of podium contention. 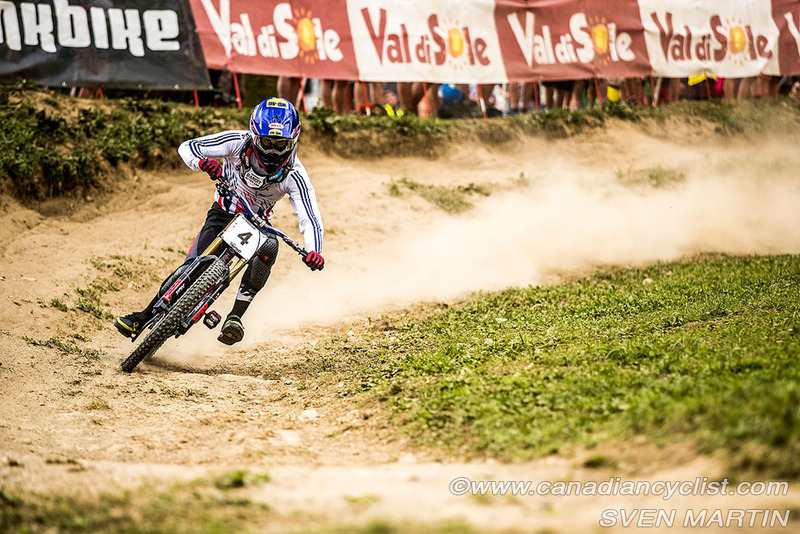 Nicole's time held up until Atherton, the final rider, came down, 3.114 seconds faster. Tracey Hannah (Australia) repeated in third place - her fourth third place - at 9.453 seconds. Canadian champion Miranda Miller was the top Canadian, in tenth place, followed by Georgia Astle in 13th. "I cannot actually believe it," said Atherton, "I was like, 'I'm sure Tracey will win, she was just riding so good in the dry dust'. I thought throw it to the wind, I just didn't care if I crashed, I've had such a good year. This track is wild, absolutely mad. You just can't ride it, you just have to go. You can't even ride it, you just fall, a controlled fall all the way down. It's just so rad like. Racing is mad. You just switch on, there's nothing else like it. I wish everyone could experience it." "The last thing I saw up at the top was Peaty [Steve Peat, riding as a forerunner], ready to sweep and, as if the pressure's not on, there's Peaty wishing me luck. I was just so nervous talking to him and thinking 'imagine if I'm crashed on the track and he has to clear me up', sweep me down, so, yah, that was a bit of added pressure." "Yes, for sure [it is the end to great season]. Winning all the World Cups? You could say it's the perfect end to the perfect season. I'm absolutely knackered and I'm glad it's the last race, but half of me is sad. As soon as the season is over, it's in the history books, it's done and you can never go back. I will probably never be as good as I am now, so I'm happy and going to try and enjoy the moment. Thanks everyone for your support it means so much." 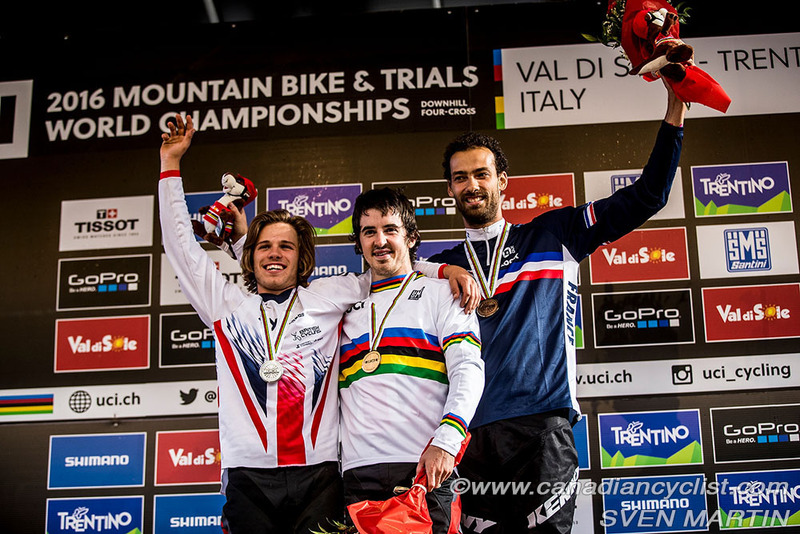 Former Junior world champion Laurie Greenland (Great Britain), riding with 20 riders to go, was the first to beat the seeding run time of Danny Hart (Great Britain), and continued to hold the lead as the top-ten began their runs, with Florent Payet (France) sitting in second. At five to go, Loic Bruni (France), the defending world champion, had a puncture part way down. Greg Minnaar (South Africa) had a strong start, moving into the third at the second split, but then faltered to finish seventh. Finally Hart, who came into the championships with three consecutive World Cup wins, started with three to go, and blazed into the lead, fastest on all points of the course, to take the lead by nearly three seconds. Troy Brosnan (Australia) slotted in fourth, and World Cup champion Aaron Gwin (USA), the final starter, flatted shortly after the start, allowing Hart to claim his second world title, followed by Greenland and Payet. 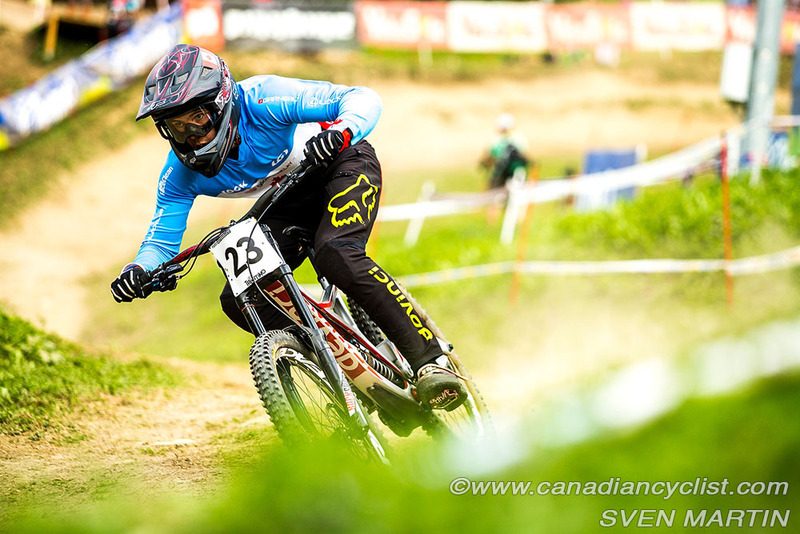 Canada's Mark Wallace had a strong performance, finishing 11th, with Kirk McDowall 27th and Max Scharf 50th. "After the year I've had I could believe it [was possible to win]," said Hart. "I've been working hard and this has always been a big goal of mine, but I took the pressure off this week. I thought 'well, I've won the last three World Cups, lets just ride the course and see what happens'.... and I took the win." "The last few months have been massive, because the last five years [since his world title in 2011] has just been just a pain. I'm thinking 'What's going on here? Why can't I get back to it?'. And then it all came at once. Just getting back to where I was has been a hard mission. All those saying I'm a one hit wonder, well I've done it four times in a row and there's not many done that." In the Junior competition, Missiaggia was by far the fastest for the women, finishing 11.946 seconds ahead of Samantha Kingshill (USA), with Flora Lesoin (France) in third, at 25.960 seconds. The Junior men saw a 1-2 finish for Canada, with World Cup champion Iles the only rider to go under three minutes and 50 seconds, at 3:47.405 . His compatriot Magnus Manson took the silver medal, 3.796 seconds back, followed by France's Gaetan Vige, at 4.610 seconds. Henry Fitzgerald (Canada) was 29th.